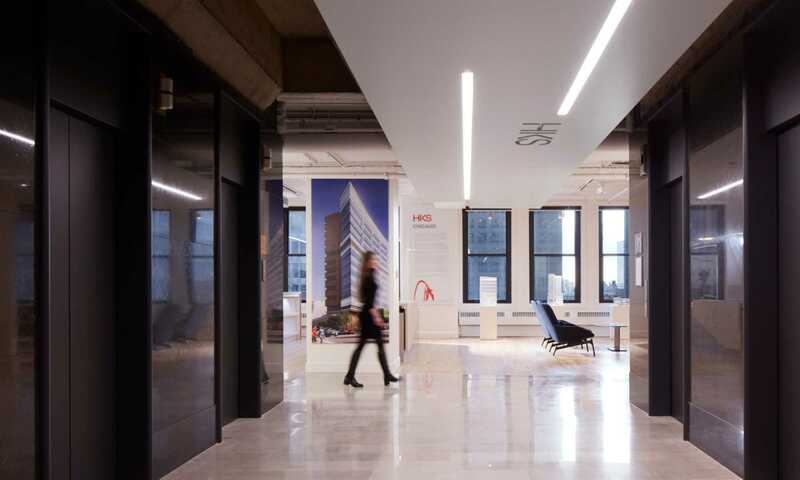 Located in one of the world’s most competitive architecture markets, HKS Chicago recently moved to a new location in The National, at the center of Chicago’s Loop. We call our new office a Living Lab, because we’re committed to leveraging it to explore new design ideas, and to observe how those ideas change our behavior and create healthy, productive and happy work environments. 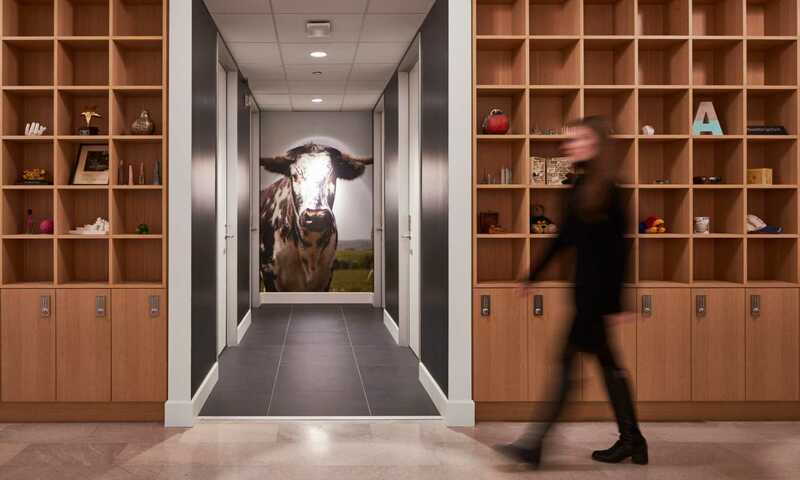 We want our new office to embody and reflect our core design beliefs, and one of those ideas is the notion that in addition to being beautiful, great design is healthy, resilient and sustainable. As a result, we decided to set a high bar and pursue both LEED for Commercial Interiors V4 Platinum and WELL Gold certifications, with LEED achieved and WELL under review. The WELL certification program links personal and public health outcomes to the built environment. 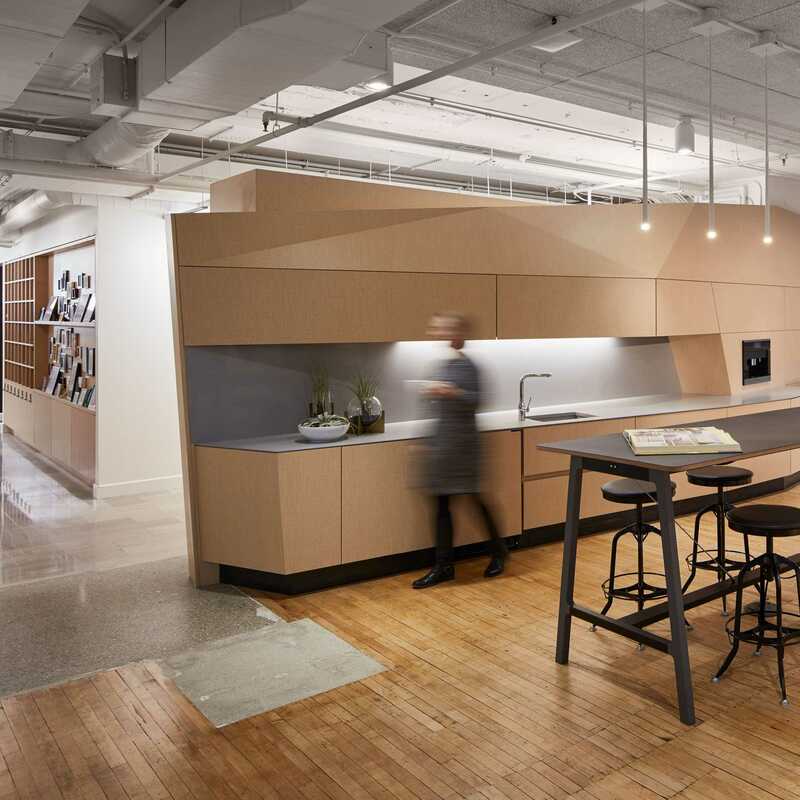 WELL certification brings value to our clients and the communities we work with because it’s a program that teaches new and compelling ways that design can lead to greater health and well-being, which enables HKS to deliver higher quality projects. This is fundamental to being a responsible design practice. While LEED is familiar territory for HKS, going through the WELL certification process today is like the experience of pursuing LEED certification 15 years ago. In the beginning, there was a sense of unfamiliarity within the WELL terrain, and we did bump into new design challenges. It’s a process that requires discovery and alignment. For us, the process involved going through and understanding, credit by credit, the synergies and overlap between LEED and WELL, and it’s helped us create a more productive environment. During the design phase, there was a focus on improving indoor air quality, one of the biggest factors affecting employee performance. Through measurement and verification of pre- and post-move air quality tests, we proved that the air quality in our new office space improved by 27 percent, through meticulous material selection and carefully planned HVAC integration. Right off the bat, we’re providing an elevated experience for people, especially users with asthma or other respiratory conditions. We also measured water quality. Two filtration stations provide the office with clean, refreshing and odorless water. Subjectively, people have already noticed the difference. Once the results of our pre- and post-move tests come in, we expect to see a quantifiable difference. Traditionally, ductwork is installed along an office’s ceiling. Because we utilized a displacement system that delivers air low instead of high, we have clear, unobstructed ceilings that provide more free area for acoustic treatment. We invested in absorptive tectum panels along the ceiling to lower background noise levels throughout the office. Ventilation also impacted the way we lit the space. Because there is no ductwork on the ceiling, we get more daylight penetration within the space. It provides a reduction in energy usage and supports natural circadian rhythms for people using the office. It’s another one of those things that employees noticed immediately. To ensure we deliver on the promises of enhancing our space, we’ve integrated an energy and environmental dashboard system that continuously monitors and provides feedback about our air quality and energy use. We are looking at ways the built environment influences subjective responses. The investment in the energy and environmental dashboard system influences behavioral change in our Living Lab through data transparency. It also serves as a communication mechanism between HKS researchers and building engineers/operations. Monitoring the performance enables us to ensure that our office performs as we anticipate, while maintaining high levels of thermal comfort and occupant satisfaction. While aligning our operational policies with LEED was more familiar, there was some turbulence when we aligned ourselves with the WELL building standard. There were a lot of conversations about “what we do” and “how do we change our behavior to meet WELL guidelines.” Because there are operational prerequisites you must meet to achieve WELL certification, this was one of our biggest challenges. On a basic level, we had to change our frame of mind about how we consume water, from the perspectives of how much we use and the quality of the water that people consume. Acoustics was another big shift that is arguably more compelling, but equally important. How would our design impact how people could hear within our new office? Early on, we understood that thermal comfort was a big issue in the previous space. People are easily distracted by whether it’s too warm or too cold in the office, so our goal is to optimize the environment by taking that distraction away. Our investment in a displacement ventilation system will continue to pay off, yet it came at a premium. We’re balancing that with what we’re getting in terms of productivity, which is part of the ongoing research effort of the Living Lab. We plan to share the results of that research in late 2018. Combining WELL and LEED together required a rigorous approach for selecting appropriate building materials. A high level of material research, selection and specification was required. We couldn’t rely on our contractor or subcontractor to tap into their knowledge base to find the appropriate material selection, because these joint criteria were new to them, too. The design team had to give them that guidance, which meant we had to be very diligent. Fortunately, programs like mindful MATERIALS create the transparency for the material ingredients we need. HKS has the flexibility to accommodate these challenges, but not every organization will. It can be difficult for organizations to understand some of the policy changes needed to align themselves with the WELL framework. We’re very honest with our new space. We beam with pride as we walk through it, and we are also honest about the challenges we encountered to get where we are today. Pursuing dual LEED and WELL certifications is an investment that continues to pay off for us at HKS. Our own example enriches our ability to advise clients about what it’s like to make a similar investment, and the organizational conversations, adjustments and changes necessary to get here. While the Chicago Living Lab was our first effort, HKS offices in London, Miami and Fort Worth are building upon the lessons we’ve learned in the Windy City. 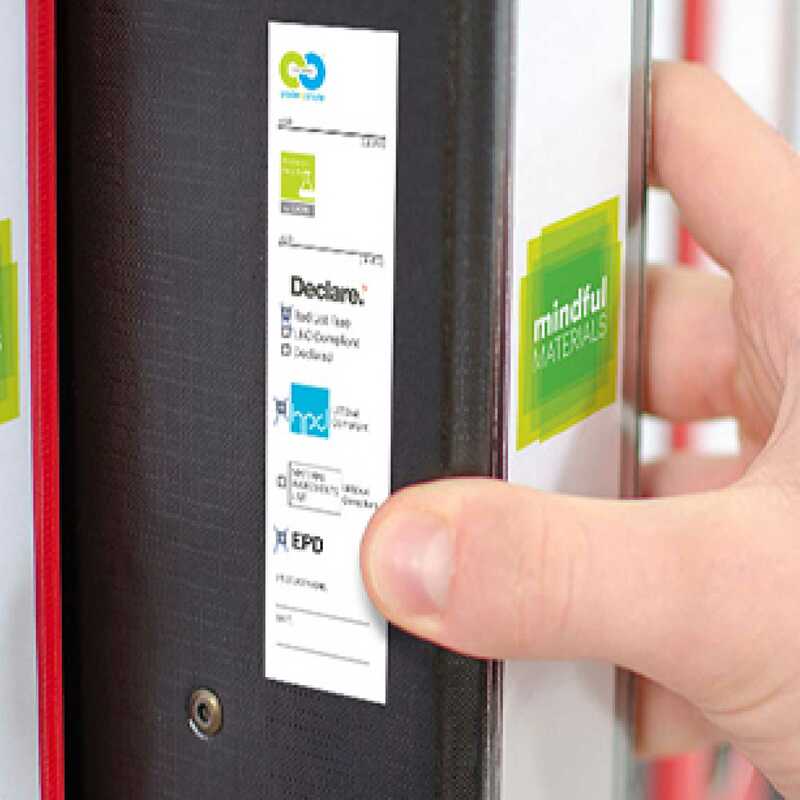 At the Chicago Material Chemistry Workshop on March 12, sponsored by Shaw Industries and HOK, we publicly announced the HKS mindful MATERIALS library labeling initiative, introducing the logo, label and system instructions. Tommy is responsible for delivering high-performance, integrated building designs and the re-positioning of existing buildings through detailed energy analysis. Tommy has a track record of leading energy focused projects with deep dives in computational building and behavioral analytics, while providing creative and holistic approaches to sustainable design.